In this present era the technology updates and demands of cellular operators are increasing promptly and the largest number of cellular operators needs unique invention of various telecommunication technologies for using on regular basis. 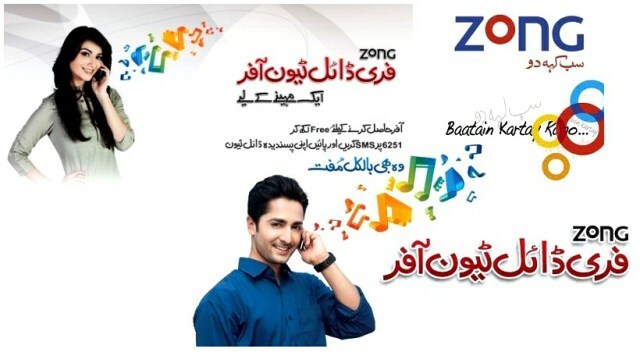 Zong brings dialer tune facility for its valued subscribers of Pakistan now subscribers of this network can easily add his/her favorite music track on dialer tune. This is an amazing service has launched from this network side for its consumers. Now you can easily express your feelings and gesture by using Zong dialer Tune. This is also a very efficient for all those people who are in love and they want to share feelings so just need to subscribe this facility and add favorite music track on dialer tune and when your love one will call you so he/she will surely listen your added music track. For the daily subscription just need to write message “REG D or REGD and send into 230”. For the monthly subscription just need to write SMS “REG M or REGM and send to 230”. Customers can also make registration via dialing 230. The subscription charges of daily use are RS 50 plus tax. The subscription charges of monthly use are RS 25.00 plus tax. Subscribers can easily subscribe this feature for single day through SMS just need to write text SUB D or SUBD and send into 230. Consumers can easily activate this feature for month via SMS service just need to write message SUB M or SUBM and send into 230. Subscribers can DE-activate this feature through SMS just need to write UN-REG and send to 230. Consumers can also DE-activate this service by dialing 230 and follow the instruction of operator. The DE-activation fees are RS 1 plus tax. This facility is available for postpaid and prepaid customers. This telecommunication reserves rights to DE-activate this offer at anytime without being informed of consumers. This network keeps rights to change or vary subscription charges at anytime without any notification. There are no hidden and extra charges of this service.